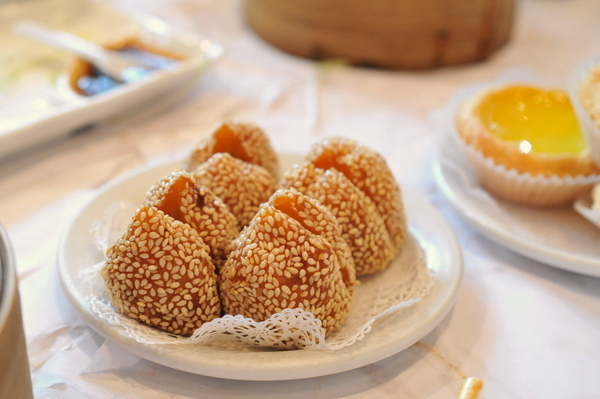 Perhaps I'm a bit biased but I think the SGV has the best dim sum in the US though from what I've heard Koi Palace and Yank Sing compare favorably. 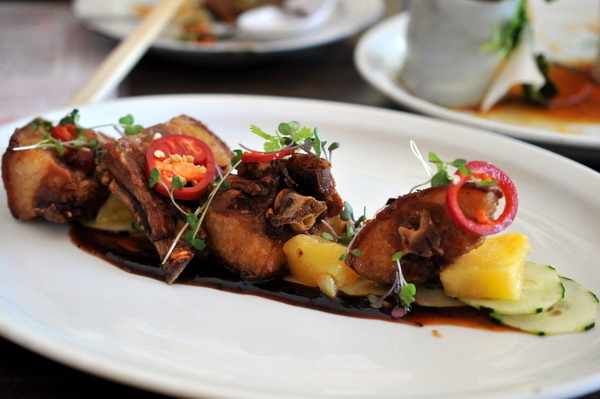 Koi manages to stand out through a selection of distinctive offerings not found at many restaurants and I quite enjoyed the food on my visit last year. 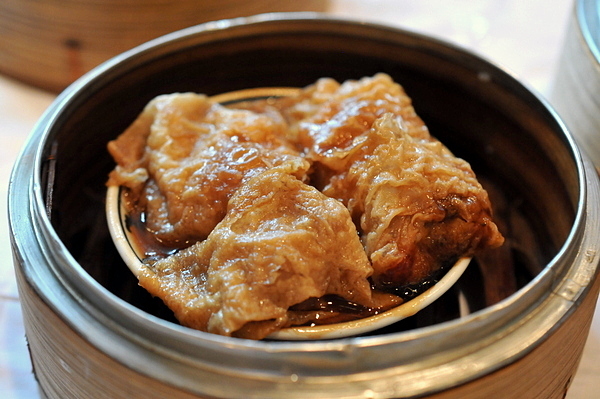 Yank Sing doesn't have the progressive flourishes that Koi has on its menu, but it certainly does have the weight of history in its favor. 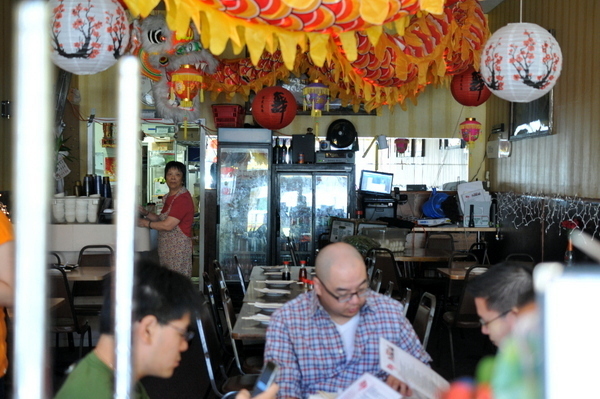 The restaurant was opened by Alice Chan in 1958. Her son Henry started working in the restaurant at the age of 9 and moved it from its original home to the financial district in 1974. Today Vera Chan-Waller can be found in the kitchen continuing her family's tradition. 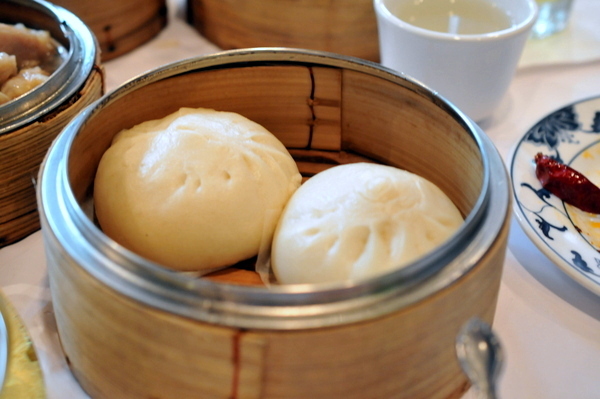 Odd that a Cantonese restaurant known for its dim sum would list Xiao Long Bao as their signature, particularly one that was wholly mediocre. 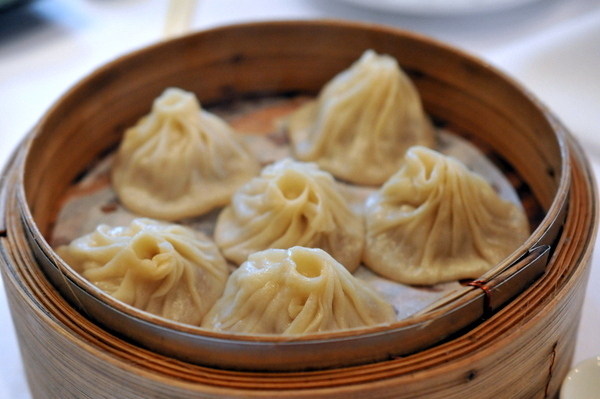 The skin was a touch drier than I would have liked but other than that the dumpling was fairly standard. 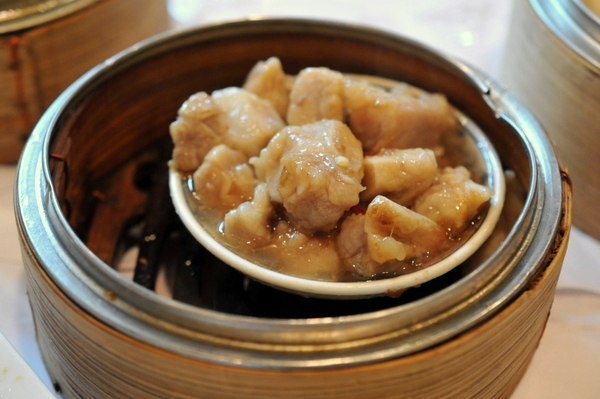 Not a traditional dim sum item, but the straightforward presentation kept this from feeling progressive either. 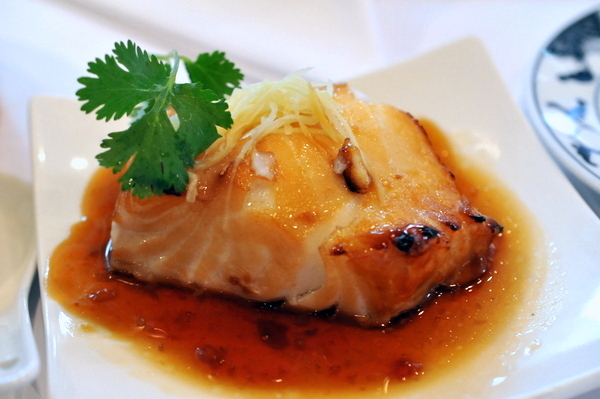 The fish was dense and flaky while the honey provided a nice contrast to the flavor of the soy. 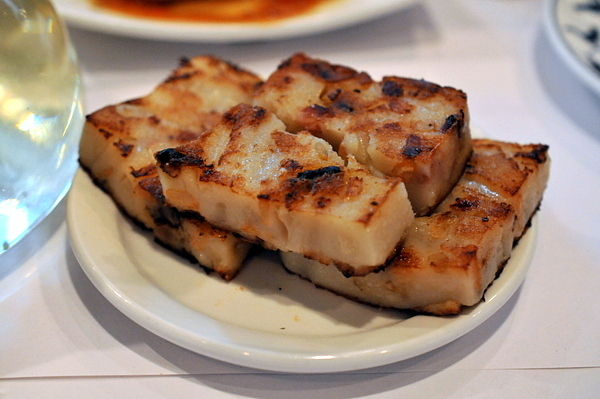 I have been spoiled by the turnip cakes my parents made at home. To be fair this preparation did have an enjoyable texture but the sparse filling made it a bit monolithic. 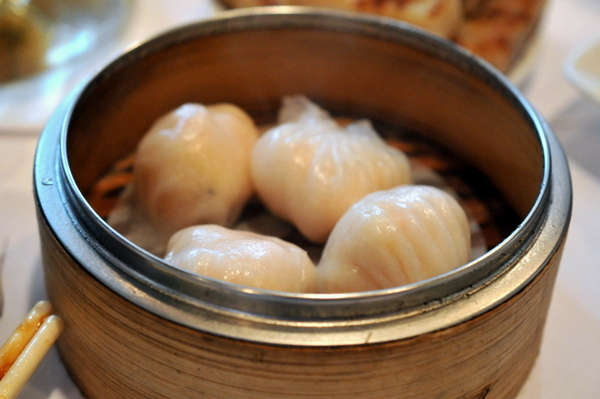 Har Gow is one of the staples I use to judge any dim sum restaurant and Yank Sing finally manages to impress thanks to the spot-on texture of the skin and bountiful filling perfectly cooked shrimp. 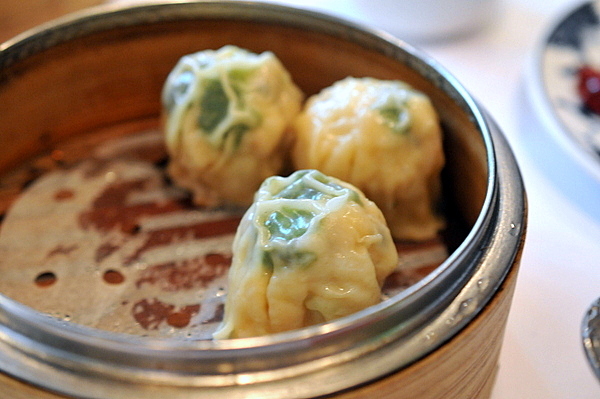 Another fundamental element of dim sum these were hefty examples of siu mye filled with dense pork interspersed with snappy bits of shrimp. 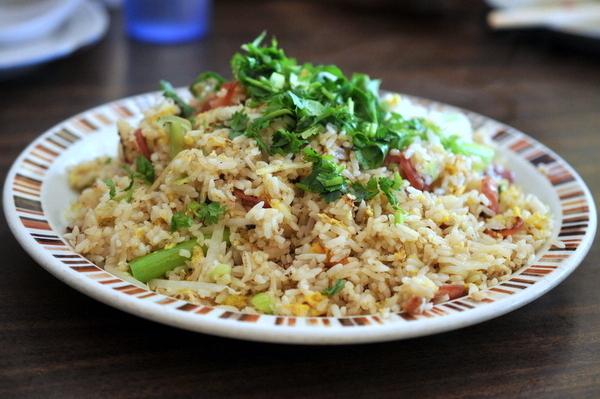 This was one of the weaker dishes of the meal. 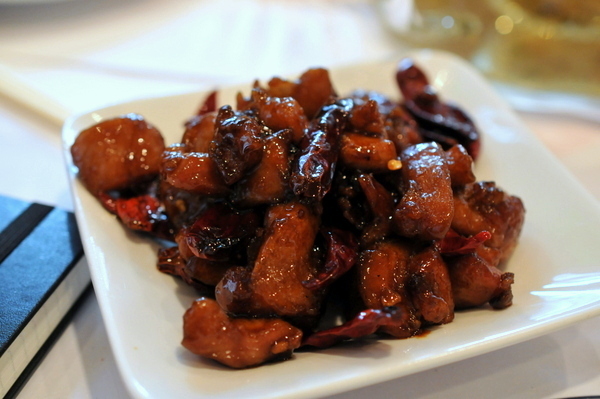 The spice was fairly mild and the chicken itself was dry; bland and boring it was difficult to eat the entire plate. When piping hot these are one of my absolute favorites, these came to the table tepid at best though to their credit at least there was a lot of filling. Kind of mixed on this one, the scallop was a little overdone but at least the morsel had a nice umami savor to it. I would have preferred the baked BBQ pork bun but they were sold out for the day. 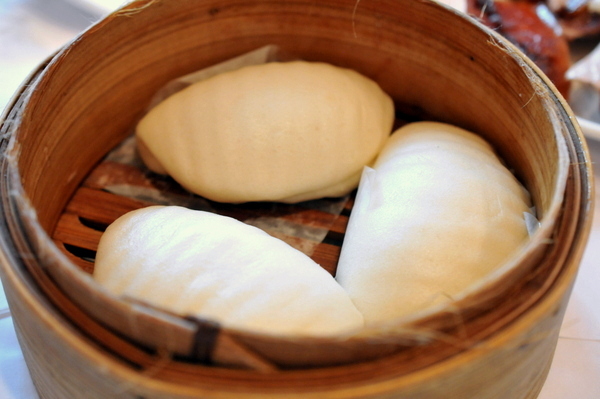 The steamed buns had nice airy dough but the kitchen was shockingly stingy with the BBQ pork. It seems Yank Sing's strength lies with the classics, the spareribs had a nice balance of fat and lean meat; the former gave the ribs a good flavor while the latter provided a nice snappiness to the meat. 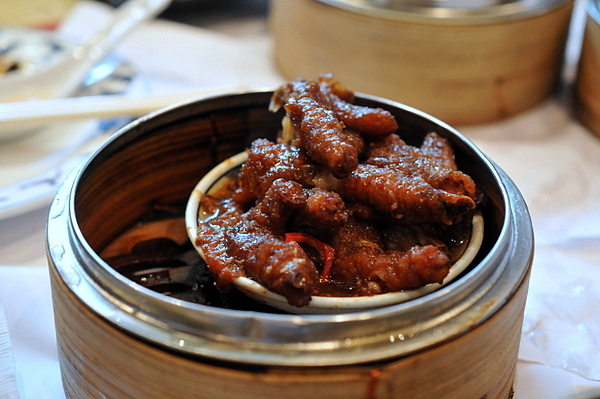 Classic chicken feet, drenched in sauce, the feet have a distinctive texture thanks to their intricate preparation that includes deep frying, steaming, simmering and stewing. Wrapped in the stringy yuba is a mix of lightly springy mix of cooked vegetables this would have been better but the sauce was a touch thin and the relatively mild filling definitely needed some help. 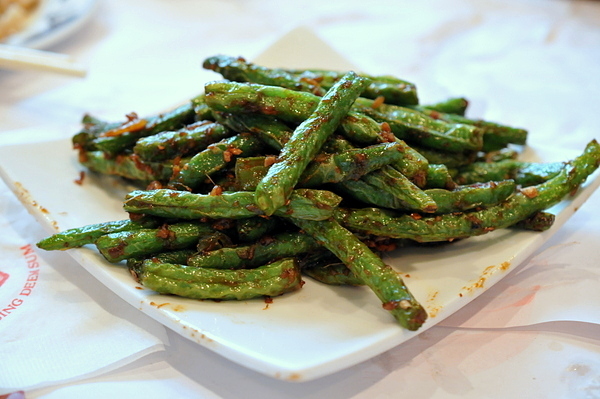 A solid dish, the beans had a pliant but slightly snappy texture and an inherent vegetal sweetness that paired nicely with a lingering spice. 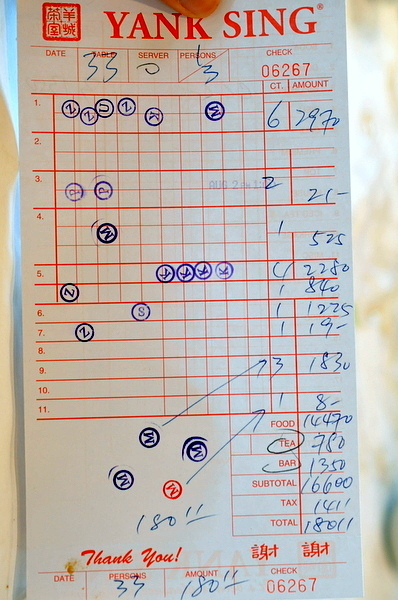 At $5.70 EACH, our four buns cost a whopping 22.40, enough to get you the entire bird at some places. 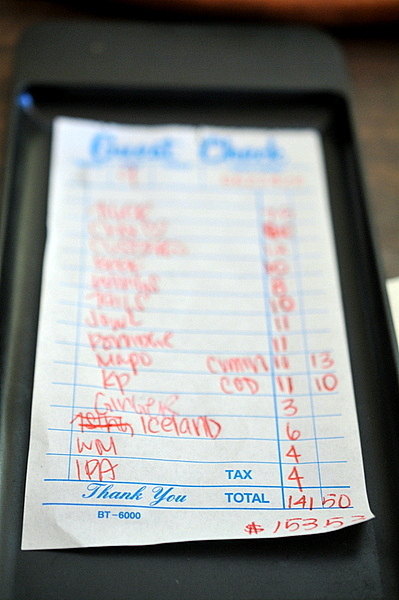 Setting aside price for a moment, the duck wasn't even fresh. The meat is pre-sliced and pushed around on a cart so by the time we got ours the skin wasn't crispy and the fat had congealed. To add insult to injury, the staff didn't want to give us our last bun since they typically serve them 3 at a time and we ordered four pieces, might I suggest not selling them individually then. These are one of the more popular desserts, but I've never really cared for them. These were well done and generously filled with mung bean paste, but I didn't find anything particularly noteworthy about them. 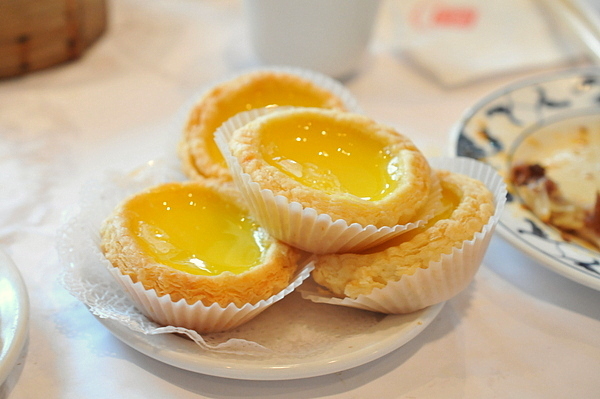 I absolutely have to have egg custard tarts before I consider a meal of dim sum complete. The custard itself had the right balance of egg and sweetness but the crust needed to be flakier. Inexplicably, Yank Sing charges $10.50 for the desserts which are should be among the cheapest items available, with prices as low as $2.17. When she heard the price, a friend asked if it was the Swallow's Nest Egg Tart that is apparently all the rage in HK; sadly it was not. I came to Yank Sing with high hopes, but the food is mediocre at best and certainly not up to the level of my favorites. Given its location, I suspect the restaurant caters mainly to gwailo on expense accounts and gullible tourists like me and my friends. I know I harped on the price which isn't normally an issue for me, but the obscenely high prices merit mention. 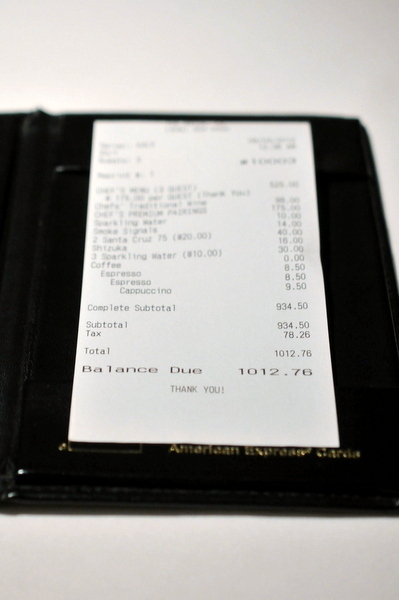 It was especially galling to pay $50 per person knowing that a comparable meal back home might cost as much for all four of us. Lackluster food at an astronomical price, there is absolutely no reason to visit Yank Sing if you are paying for it yourself. Typically when a restaurant goes from pop-up to permanent that really says something about the quality of the food. 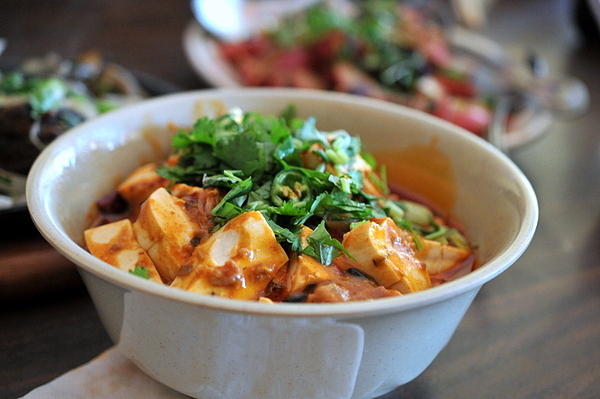 Mission Chinese managed not only to take over its original location but open a second branch in New York and get named one of the best new restaurants in the country. Naturally with so much hype, a meal here was a must. 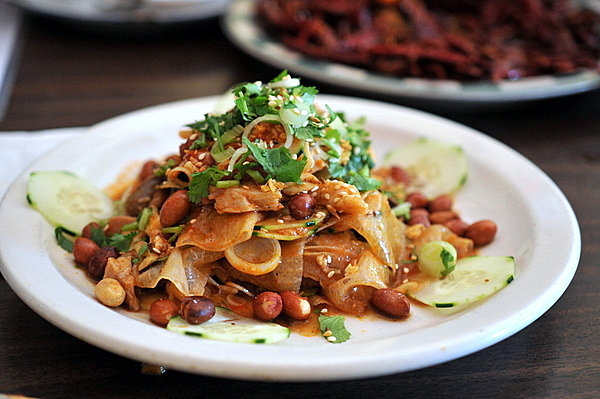 Mission Chinese's claim to fame is its complicated yet quirky style of Americanized Chinese food to San Francisco's Mission District. 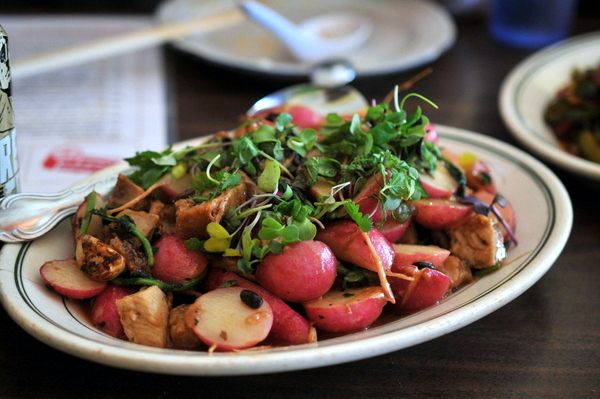 The restaurant's founder, Danny Bowien is equally unconventional: a Korean brought up in Oklahoma with no previous experience cooking Chinese food. 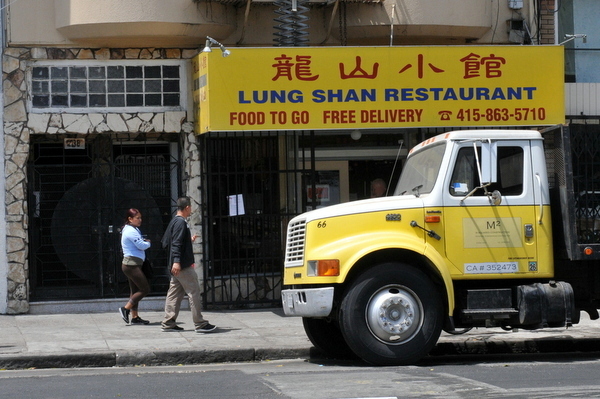 As the pictures below attest, the restaurant itself remains relatively unchanged from its days as Lung Shan, a run down fairly nondescript Chinese restaurant. 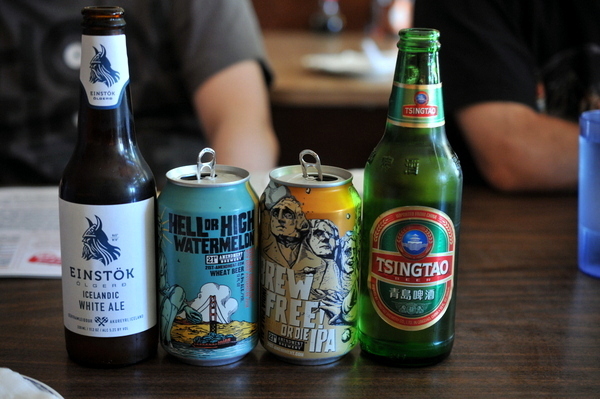 I was surprised at the beer selection as hipster staples like PBR felt better suited to the vibe at Mission Chinese. Though I was intrigued by the beer from Iceland it lacked the citrus and coriander that I associate with Witbier making this more reminiscent of a hefeweizen. Some of my friends likened the watermelon wheat to drinking a Jolly Rancher; while I got some melon flavor I thought that was more of an afterthought. The IPA was much less interesting than the watermelon wheat, but the bitter hops were well-suited to countering the spice and salt of the food. No Chinese dinner would be complete without a cold Tsing Tao, though naturally this was the least interesting of the beers. 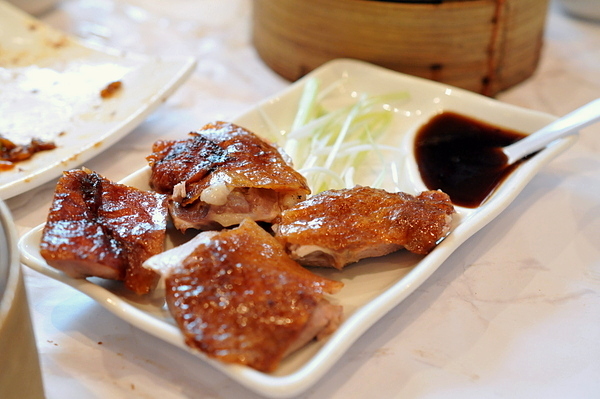 Though I can't think of a traditional Chinese analogue, this was easily the best course of the meal. The eggy funk is overlayed with strong briney flavors from the duet of roe while the fruits give the the broth a lively fruity relish. This thing certainly lived up to its billing, it was actually difficult to find the chicken beneath all the dried peppers. The few pieces of tender chicken were doused in a spicy powder that started of with a slow burn but that eventually stole all sensation. 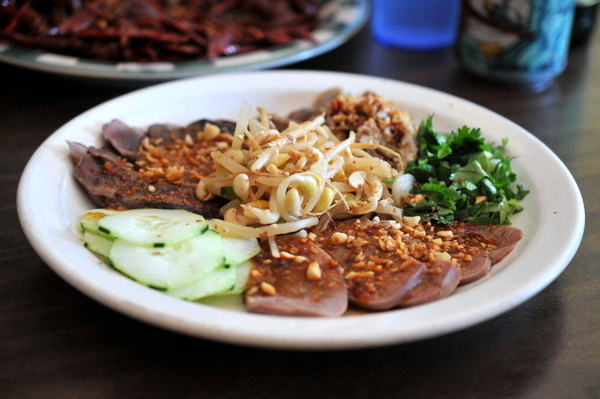 Though I don't know what it says about married life, texturally the offal was fantastic and very reminiscent of "ping pan," a plate of cold meats commonly served at banquets and marriages. With my palate still reeling from the last course I wasn't able to taste much and the numbing chili in this course didn't help matters any. With the sheer amount of numbing chili, I could have very well been drooling and I wouldn't have known any better. The snap of the chicken hearts was quite satisfying with the thin crunch of the vegetable noodles. 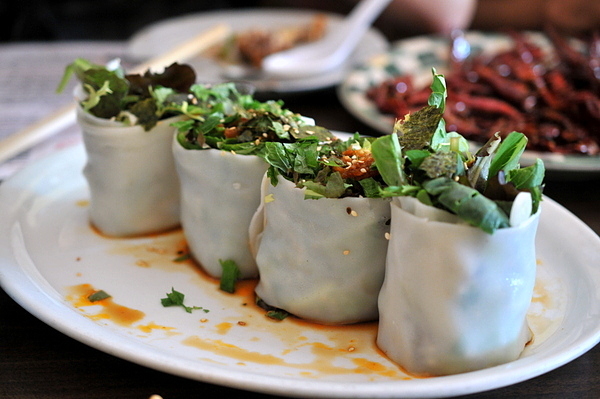 The overall flavor reminded me of hóng yóu chao shou, a classic Szechuan dish of boiled dumplings and chili oil. The last of our cold dishes the crisp cool vegetables were just the thing to cleanse the palate after all that numbing spice. Though the salad had some kick of its own, it was balanced by the aromatic fragrance of the herbs and bitter lettuce. With a strong savor this was actually a pretty solid fried rice however I was expecting the mackerel to play a bigger role. In the end, this was the most traditional tasting of all the dishes and while I found it tasty, some of my party found it a bit boring. The jowl was cooked beautifully with a mix of snappy lean meat and flavorful fat. I couldn't really make out the funk I associate with fermented black bean but I certainly got their saltiness. The radishes provided a countervailing bitterness but both flavors were so intense instead of tempering each other the contrast felt jarring. 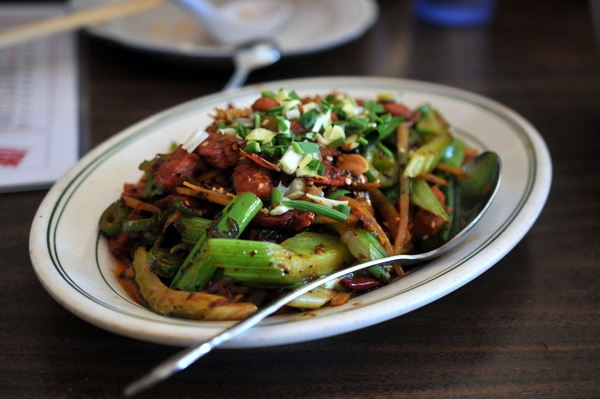 I think this dish nicely captures the combination of Chinese flavor with contemporary American techniques that Mission is known for. Smoky spicy and with plenty of fat, the dish certainly had all the characteristics of a pastrami, but using such a full flavored proteins left little room for the sauce to show. 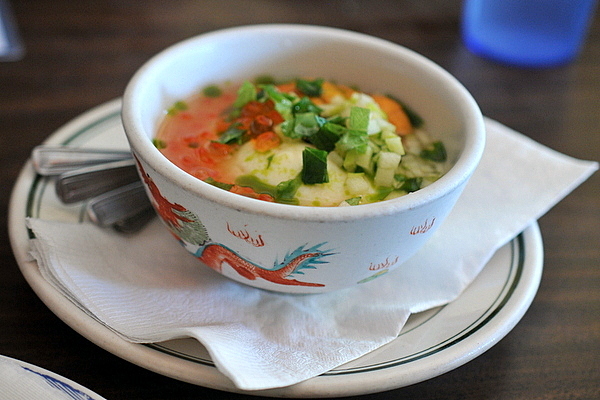 Along with the fried rice, the porridge was the other hot course that I enjoyed. While the broth felt a bit thin texturally but still conveyed classic clean mellow savor I associate with the soup. The addition of the porridge provided some semblance of substance that the soup lacked on its own. 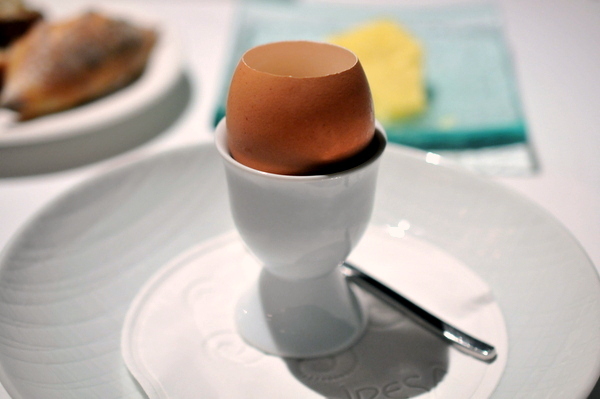 The egg was also a surprise imbued with the flavor of soy and a core that was like a dense jelly. Warm, hearty, and soulful one of my friends remarked that this would be a fantastic hangover cure. By this point I was pretty much expecting another salt-bomb and this dish certainly delivered. Earthy and pungent the high fat content of the ribs made this a particularly gamy preparation. 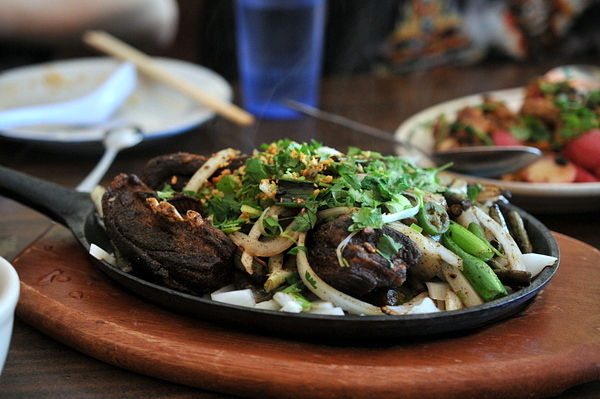 Like most of the other meat dishes, the lamb was well cooked and tender but just way too salty. After so many over seasoned courses this one jest felt bland by comparison. I was really looking forward to the pork shoulder but all I got out of this course was chunk after chunk of tofu. To make matters worse, the kitchen chose medium tofu which made it hard for any flavor to permeate the cubes. For a meal that began with such promise things quickly fell apart as we moved to the hot courses. I will say the ingredient quality is definitely a cut above your typical Chinese fare but for the flavors are blunt and clumsy. 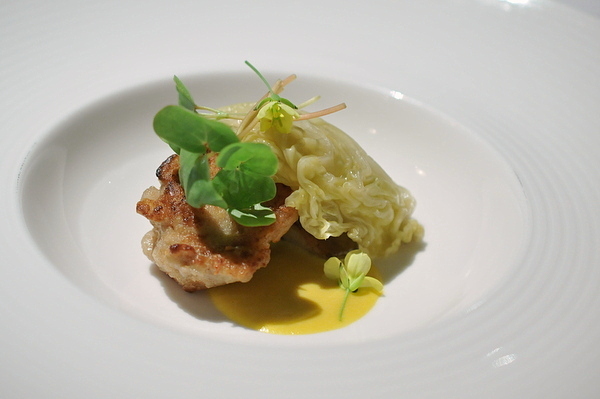 Aside from the initial egg course, most of the cold dishes relied on numbing spice, but that was at least manageable whereas some of the hot dishes were so salty to the point of being inedible. 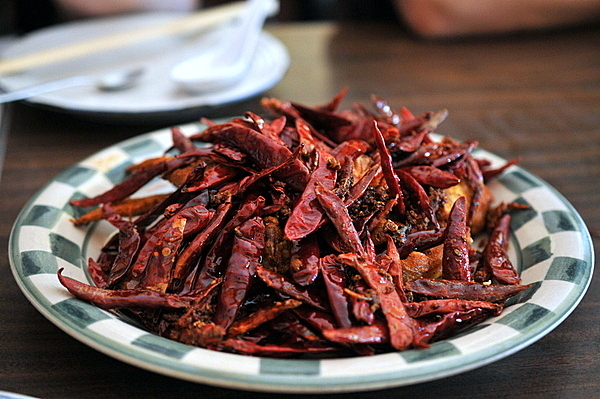 To be fair, Szechuan food is known for being full-flavored, but this was far beyond full-flavored; ultimately I appreciate what Mission Chinese is trying to accomplish even if I didn't enjoy the execution. 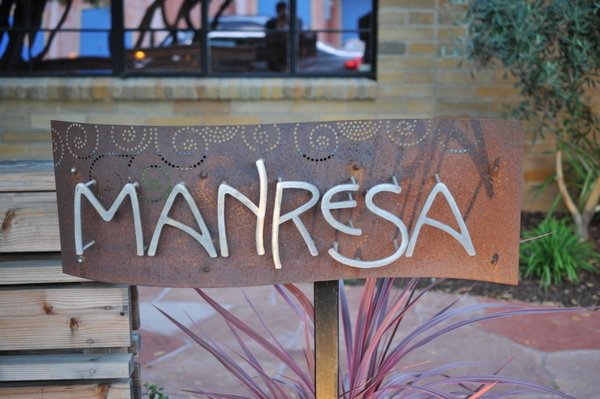 Working out of an intimate house nestled in the sleepy town of Los Gatos Chef David Kinch has made Manresa one of the top restaurants in the country. Opened in 2002, Manresa has been awarded a slew of accolades including 2 Michelin Stars every year that the guide has covered the SF Area. 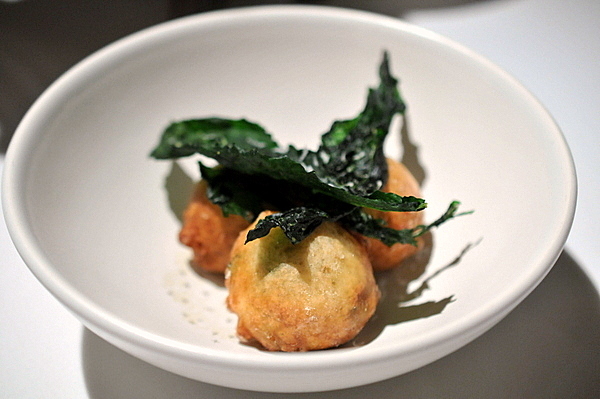 Having studied in France, Spain, Germany and Japan; Kinch incorporates a wide variety of influences into his contemporary ingredient-driven Californian cuisine. In addition to running Manresa, Kinch recently joined the French Culinary Institute as a dean of their school in Campbell where he will hopefully pass his ideas onto the next generation of up and coming chefs. We arrived a bit early and were shown to a very contemporary bar area. Naturally I gravitated towards the one with cucumber, which turned out to be a riff on a G&T, not bad but the least interesting of the three. 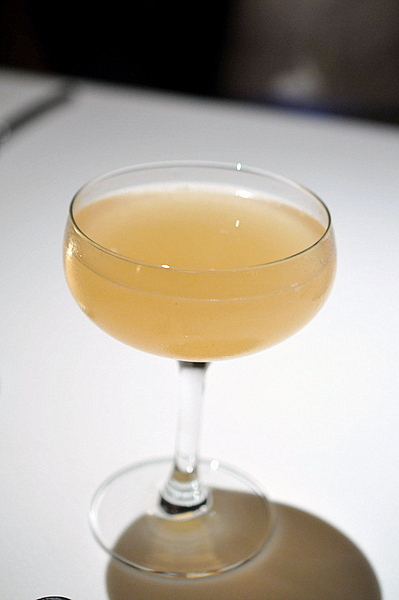 The second cocktail had predictable touches of petrol and smoke with a florid piquancy tempering the harsh edges. The Santa Cruz was my favorite of the three, subtly effervescent with a resonant citrus tang; think adult orange juice. 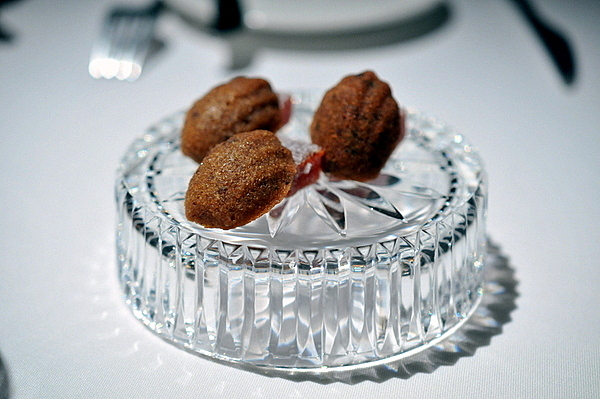 Petit fours "red pepper-black olive"
I don't believe this has changed at all since my visit nearly four years ago. 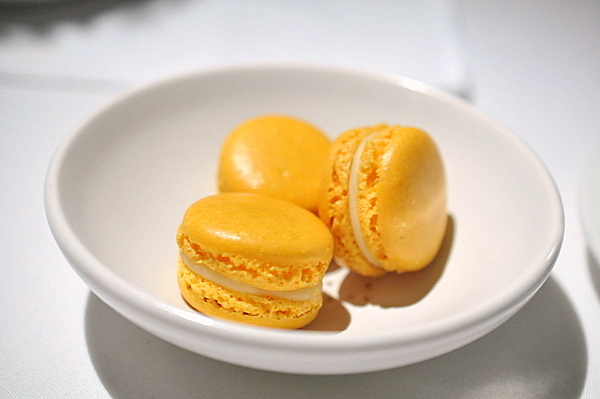 The duo of classic sweet treats re-imagined with savory flavors to tantalize the palate. The Madeline was as delicious as I remembered warm and perfectly textured with an expansive butteriness tinged with the barest hint of olive. The pate de fruit still bears the vibrant flavor of red pepper overlayed with sweetness but the texture was much improved from my last trip. The wine pairing kicked off with a duo of sparklers that was supposed to last us through the amuses. The Roederer Estate is a bit more fruit forward with strawberry and lime notes while the Diebolt-Vallois has an aggressive effervescence and balance between fruit, mineral, and yeasty notes. 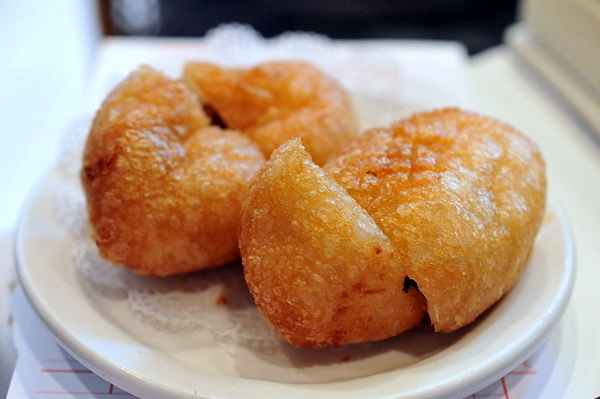 Lurking beneath the warm flaky exterior of the beignet was a medley of delights from the garden. The sheer variety of texture and flavor convey a humble rustic charm while the surrounding savory batter was reminiscent of a fried dumpling. A raw milk panna cotta sounds a bit daunting, but it was actually very reminiscent of a mild yogurt but with a smoother slightly firmer texture and its tartness played well with the piquant savor of the dashi-like gelée. Bits of fresh Monterey abalone and breakfast radish add both a crunchy emphasis on the texture as well as darts of brine and bitterness. This dish was so complex and creative my companions and I wondered if the this signaled the start to the actual meal, but it was only our third amuse! 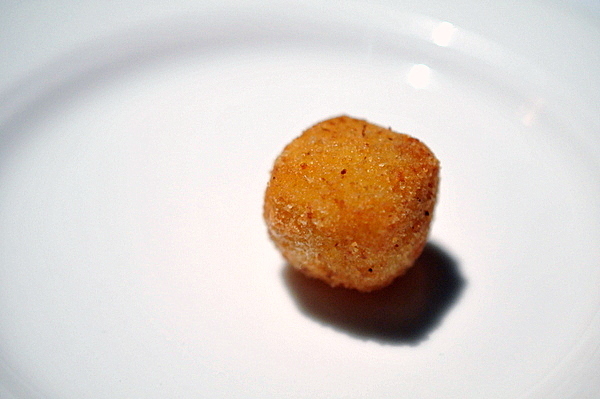 After the previous course this feels almost too simplistic, but the dainty fritter with its sweet corn filling provided an uplifting playfulness. The cromesquis were the official end to our amuses however one came sans filling and with no replacements, they opted to give us all an extra amuse as an apology. 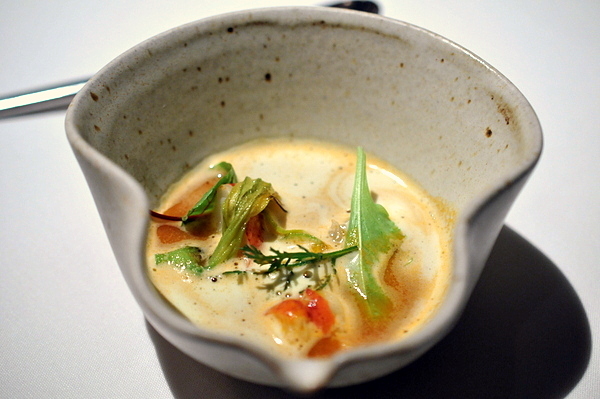 Kinch named the dish for Alain Passard's L'Apèrge where he first learned the recipe. The combination of sherry vinegar, maple syrup, chives, and an egg yolk sounds a bit daunting but key is to get a bit of everything at once. The astringency of the sherry and sweetness of the maple dominate at first but then the while the egg yolk makes itself known, a seductive blanket of golden viscosity, that brings an even salinity to balance the dish. I couldn't help but compare this to the Oysters and Pearls from the previous night. 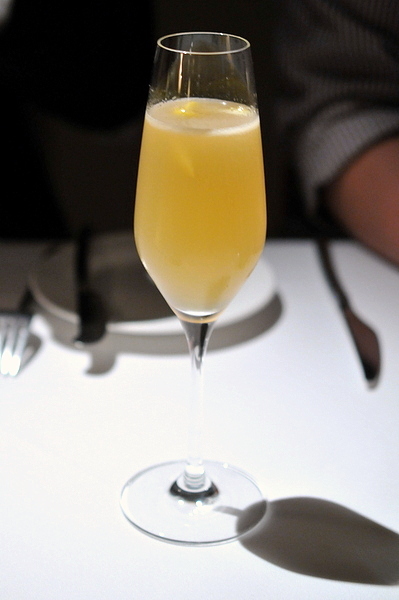 Where Keller's dish is grandiose and elegant, Kinch's is brash and ebullient. 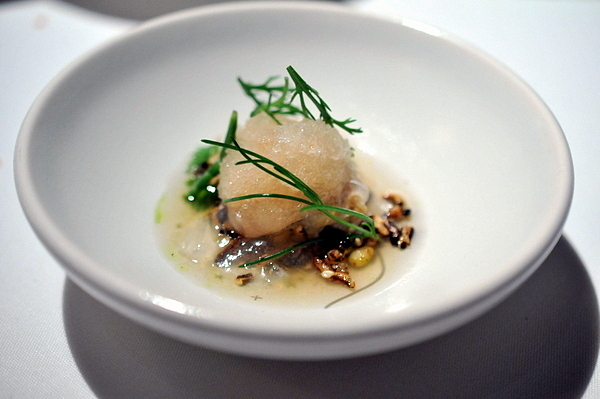 While the smoked oyster has more than enough going on to stand on its own, the bracing snowball of lemon and seaweed heightens and expands the bivalves natural brine. The bits of puffed rice might seem like an afterthought but that doesn't give sufficient credit to either their delightful crunch or toasty savor. Unlike its more well known cousins, Bluefin and Yellowfin Tunas, Bonito has an abundance of flavor lingering under the surface just waiting to be awakened with a quick sear. The fish's smokey magnificence is further heightened by the tender eggplant and toasty sesame while the fragrance of fennel and tea color the fish with a gossamer elegance. 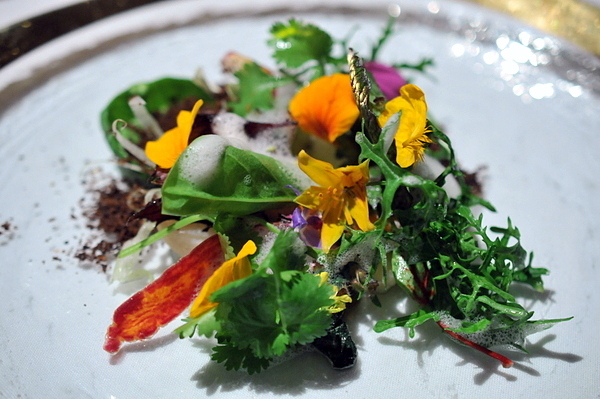 Kinch's signature "Into the vegetable garden" epitomizes his philosophy more clearly than any other course. The treasures on the plate come from Love Apple Farms, a bio-dynamic grower nestled in the Santa Cruz Mountains 15 minutes from the restaurant, with whom Manresa has an exclusive partnership. With such a high-quality purveyor of fresh locally sourced ingredients, the vegetables display a complexity that belies their simple treatment. 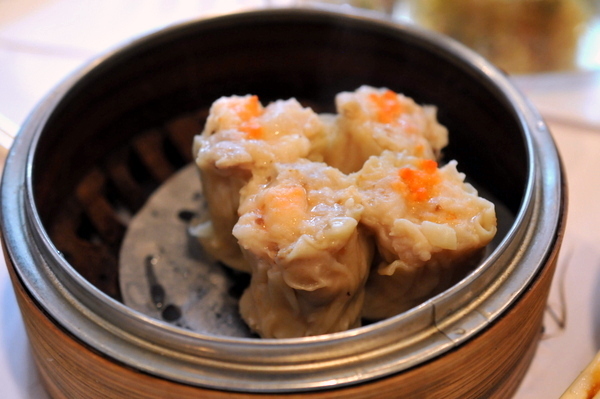 With such an array of textures and flavor it is hard to identify any dominant trait but the overall effect is sublime. The shellfish broth was satisfyingly creamy with an arresting flavor of lobster coral and exotic spice that lingers on the palate. 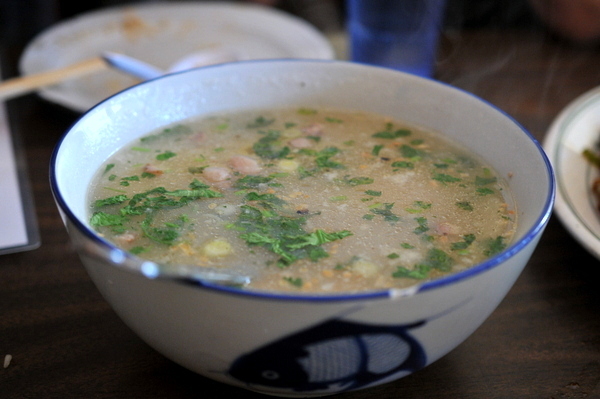 The soup comes with chunks of snappy lobster that add a concentrated shellfish sweetness to the broth. When the previous course was brought to the table, I asked after the tidal pool and though it wasn't an official part of the menu, our server was kind enough to add it to our tasting. 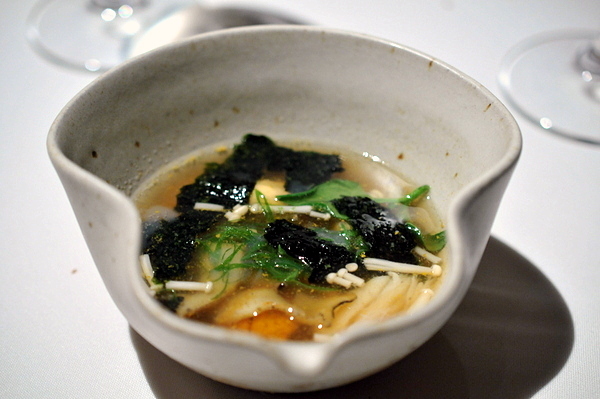 A paleagic riff of the vegetable garden, this clear broth is imbued with the bounty of the sea. Featuring abalone, uni, and mussels in addition to seaweed the tidal pool radiates a satisfying umami essence while an undercurrent of citrus is felt as a satisfying tension on the tongue. This was as good an example of cooked Tai that I've ever tasted. The skin is like a fine crystal while the flesh nearly falls apart at the merest touch. 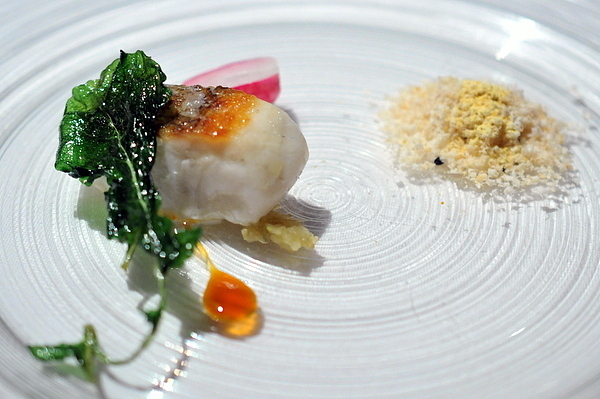 The almond, orange, and fennel are sweet but restrained enough to compliment the delicate flavor of the fish. 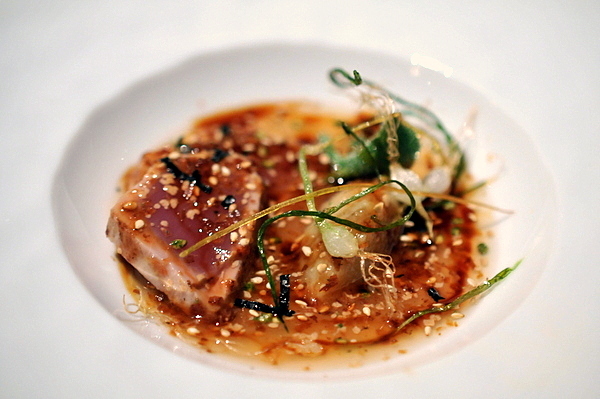 A dollop of concentrated goma shio gives the dish a touch of Japanese mystique as well. The interaction between the food and wine really picked up with this course. The Vermentino in particular had a light funk and roundness on its own but the fish gives the wine a smokineses fits beautifully with the dish. Finally we get to the weighty part of the menu. I thought my sweetbread was a touch overcooked but both my companions' though theirs had the characteristic slickness. The savory sweet soubise heightens the chicken nugget sapor of the offal while the vegetables offer a keen counterpoint. I loved both the paired wines on their own but I thought the more robust Cali pinot worked better with the sweetbreads than the more delicate Burgundy. Our final savory of the night managed to deliver loads of flavor but still have that delicate feel that pervades the rest of the meal. The meat itself is meltingly soft on the tongue; the silky flesh dissolves leaving behind a game-tinged smoky savor that feels almost illusory. 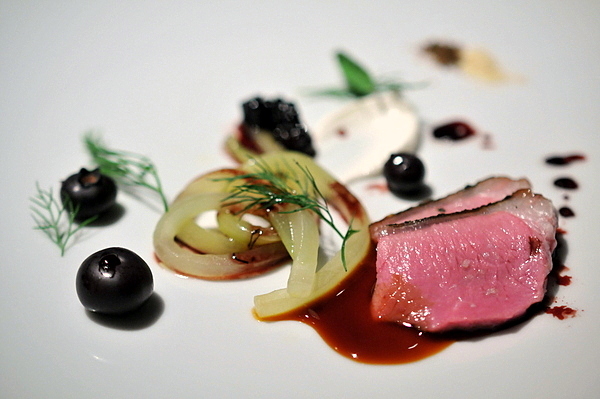 The juniper adds a poignant herbaceousness while the yogurt and cucumber feel classically suited to the lamb. The Malbec paired beautifully with the lamb; with touches of wild herbs, smoke, and fruit, everything on the plate has an analogue in the glass. 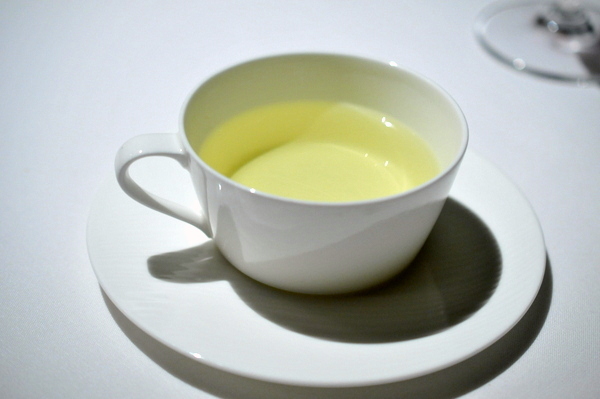 In keeping with the ethereal feel of the meal, we were given a tisane; a delicate aromatic elixir of mint, lemon balm, lemon verbena, chamomile, and hyssop to mark the transition from savory to sweet instead of the more traditional fromage. I immensely enjoyed the break afforded by the tisane and consider its addition a very evident sign of how much the restaurant has grown since my last trip. 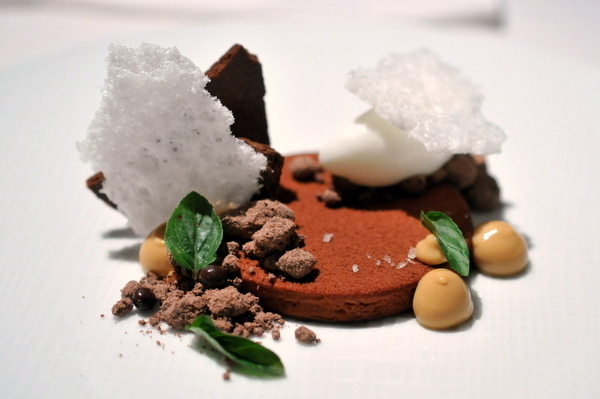 I recall my first dessert at Manresa felt a unfocused, by comparison this course unfolded much more deliberately. 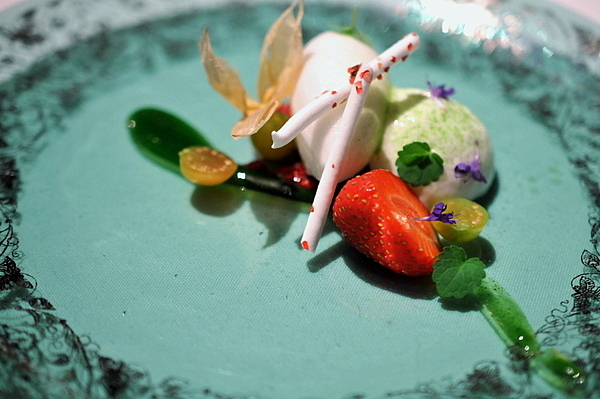 The strawberry has a pronounced jammy character that is tempered by the icy acidity of the kefir and verjus sorbet. The anise hyssop might have been a bit much on its own but the medicinal tinge works well with the bounty of fruit. 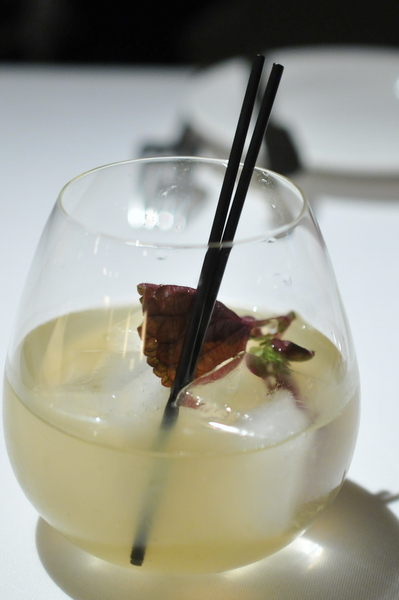 Bits of floral pink peppercorn act as a final flourish on an already masterful dessert. Built around a decadent chocolate mousse and cocoa nibs, this dessert might have been too weighty were it not for the sweetness of the dulce de leche custard and the piquant zing of the buttermilk. The pervasive flavor of fresh mint provides yet another uplifting element to the chocolate. The combination lacks some of the cerebral finesse of the earlier dessert but the flavor is no less satisfying. These treats were a nice touch; the simple attraction of fresh stone fruit couples nicely with the soothing floral quality of the chamomile. 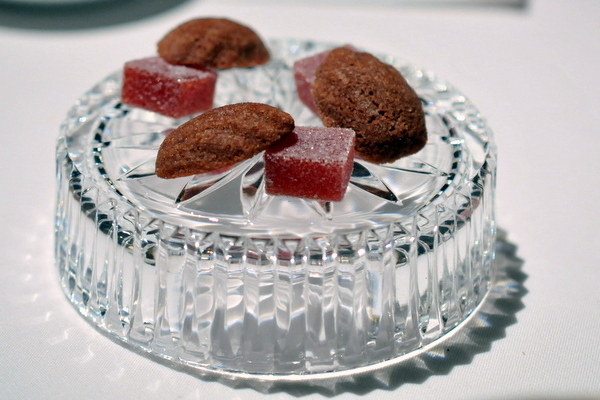 The meal ends much as it started with a Madeline and pate de fruit. The chocolate and strawberry duet is perhaps less unconventional than the red pepper and olive but the care that went into their creation is no less meticulous. 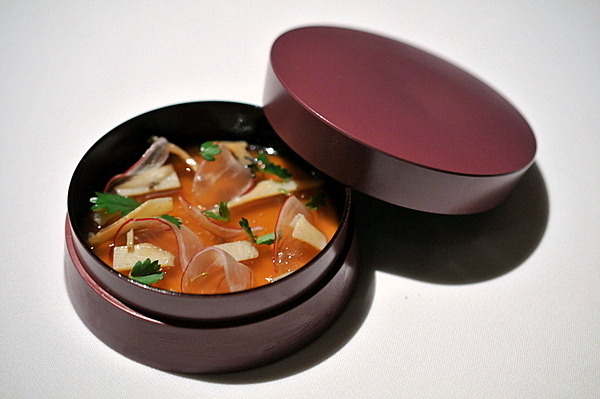 As good as my first visit to Manresa was, Kinch has really upped his game since then. The food has become even more polished and refined but still maintains the simple purity of flavor and ephemeral nature that I associate with Kinch's cooking. I had high expectations for Manresa, but this was the best meal of the entire trip by a wide margin. Manresa is one of the frontrunners for a third etoile in the next Michelin Guide, and based on this meal they certainly deserve it.